Safari Style Front Bumper...Designed with unique cargo basket to carry gear, chains, tool bag, Load-N-Go Winch System or Stationary Winch. Bumper designed for protection, function, strength and GREAT LOOKS. Constructed of 2 3/8" drill stem pipe, diamond plate and expanded metal; weight 100 lbs... Bolt on Bumper designed with universal hitch receiver to attach portable winch or accessories. Also available with fairlead (add $55) for stationary winch mount. Upper expanded metal screen is cup formed (like bra, subtle but cool design) allowing off road lights to be mounted forward providing additional clearance for easy removal of portable winch or cargo. Bumper is sandblasted and epoxy coated before enamel painted (automotive finish) dark gray, black w/silver or pewter. Front Bumper makes a match set to rear Safari Style bumper. 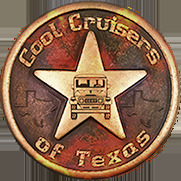 Both Bumpers are built with Exceptional QUALITY metal work and finish... Made Exclusively by "Cool Cruisers of Texas."